Nothing great was ever achieved without some degree of consistency. Business. Health. Friendship. Music. Education. Infrastructure. Career. Dance. Marriage. Government. Innovation. Romance. Architecture. Art. Finance. Spirituality. Literature. Justice. Personal Growth. Philanthropy. 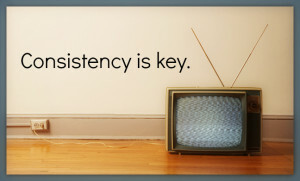 Inconsistency is synonymous to static: it takes up space, is distracting, and ultimate facilitates a loss of focus. It is often the heavy sludge through which we carry our proclaimed ‘best effort’. It’s arduous, messy, and is largely self-inflicted. Rather than increase our ‘best effort’, our better effort may be to identify the areas of our life where we’re slowing ourselves down… and become more consistent. If it matters to you, clean it up: consistency is key!